When I first set foot in Mensah Dawa, so many questions ran through my head simultaneously. I wondered how my life would look here, if the people would treat me well, and will the students thrive under my instruction? As we came to my small house behind the school, we passed through the primary school playground. It was like many other playgrounds for the most part, various pieces of equipment scattered beneath large old trees that provided shade. But the most distinguishing factor was the roots of these large trees. The trees were of varied types but all stood proud and tall, as old trees do, reaching far into the sky. The roots stretched far out from the bases of the trees in all directions like tendrils. However these roots appeared more prominent than an old tree’s roots ought to. This is the detail that caught my eye after a minute of surveying the scene, as a result all the large questions that were running through my mind came to an abrupt end. 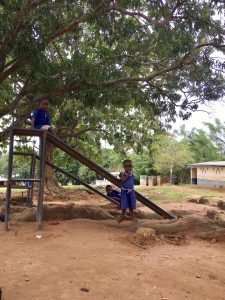 The playground resides at the bottom of a large hill that the community of Mensah Dawa sits upon. Mensah Dawa is not a large town, it’s home to at most 400 residents that are very spread out over a couple of miles up and around the hill. Nonetheless, this hill sends a large portion of the water that comes off of the homes and other buildings down to the playground. When the water reaches the hill, the only thing to block and slow its march down is the tangled roots of the many trees that shade the playground. Over the years since the school has been at this site, the water has caused a large portion of the dirt in the playground to be swept further down the hill. The roots, however, have not moved and continued to grow regardless of the ground around them. In the worst of places, the soil is so eroded that the roots that were formerly below ground when the tree was younger are now so far above the soil surface that they can be used as benches, sitting two feet off the ground at most. Since my time with AgriCorps started a few months ago, I have become familiar with the goals, ambitions, and methods of the organization. 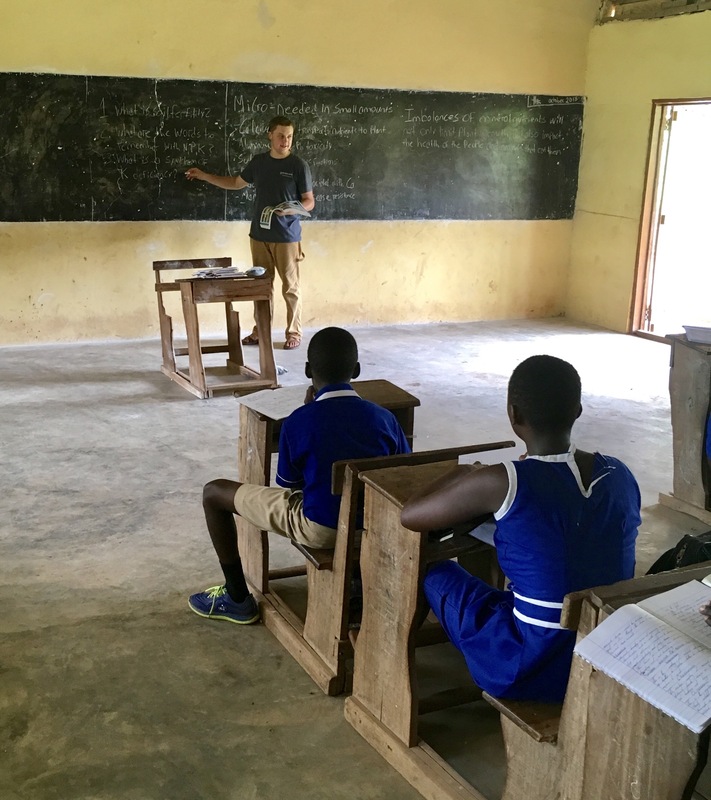 One of the foremost principles that is expressed to my team throughout the training process is why it is important that our team is stationed in Ghana for a relatively long period of time, especially when compared to other non-government organizations that do similar work to ours. 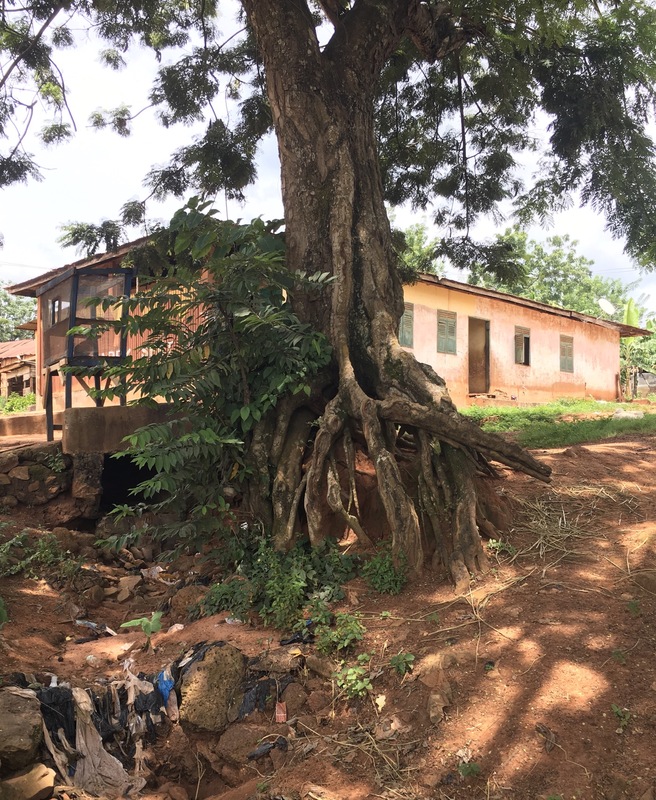 When a short-term group comes to a community such as Mensah Dawa, groups that are frequent in West Africa as a whole, they often arrive and shower the people of the community with money, labor, and no shortage of kind words. Then, after the well is dug or the house is built, the group leaves at most a short two weeks later. While I have no doubt that these groups of people come with the intention to come and love and support people who they perceive to have less than they do, they often meet many of the short term needs but are not present to see the unintended fallout of their good intentions. In this context, the people who are coming to aid the members of communities like Mensah Dawa are very often foreigners from across the world who have no idea about the real needs of the people they are there to help. They only see what is plain to them, these people don’t have access to clean water, so lets dig a well. They come and try to alleviate the challenges that they themselves can see but they don’t put the time in to see the real needs of a community, only time spent in and amongst the people of that community can make these true needs apparent. The distinguishing factor that differentiates AgriCorps from many other NGO groups is that we understand that it takes time to comprehend the deep-rooted challenges that people in more impoverished parts of the world are faced with. As I considered the roots in the playground and the factors that caused the erosion of the playground, a thought came to me. Just as the ground of this playground has gradually been swept away over the years of water rushing across it, so has the ability of these trees to gather water. Water is both the life sustaining substance that is essential for the survival of the trees and the thing that is gouging deep cuts in the ground that the trees are rooted in. Water gives life with one hand but over time takes life away with the other hand. Anyone that knows me well knows that I have a passion for soil and how soils function in an agricultural setting in particular. But instead of thinking about how this erosion would impact the plant life in the area, I immediately thought of an analogy that continues to trouble me more than any amount of erosion. The efforts of many over the past few decades in Ghana and in Sub-Saharan Africa as a whole have not been in vain. There is much evidence of growth and success as a result of the investment into communities not unlike that of Mensah Dawa where I am currently working. However, while the initial needs are being met, the long term situation of these people has not been adequately addressed when people come here solely to invest in the short term challenges. 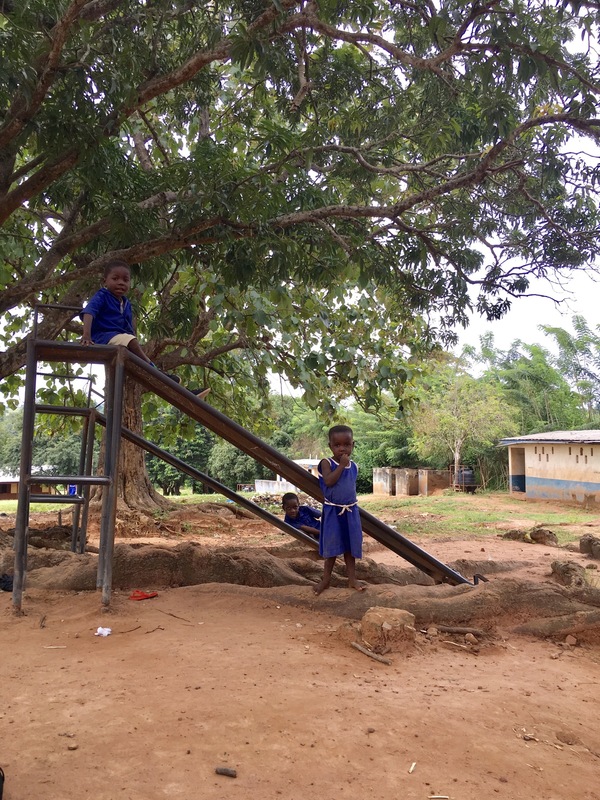 Like the playground soil being washed away by the outpouring of water from the village above, so to has the ability of the people in impoverished areas to address their own challenges. The trees now cannot gather water as they once did. Similarly, some people in many places around the world have a reduced ability to innovate solutions to their own problems. During the first week of training here in Ghana, our team visited a government owned, but farmer operated irrigation farm not far from Cape Coast. At this farm we sat down with the 65+ farmers who were responsible for this 45 hectare vegetable farm and discussed how their farm operates and what challenges they face with the wide variety of crops that they grow. We talked briefly about declining soil fertility and pest problems in the field corn, but the predominant part of the discussion was spent on a single topic that surprised me when it was first translated. The manager of the farm was the main spokesperson for the group and he explained the hours of intense labor they spend every year hand tilling the fields with hoes. He then proceeded to ask us, point blank, if we would be willing to buy the farm a tractor to plow the fields so that they would not have to plow by hand. This question came from a group of farmers who didn’t know what our team was there to do and didn’t realize that we aren’t the type of group to come and write blank checks and walk away. These farmers, I presume, have had previous contact with groups that would have been interested in buying them a tractor to help them produce food more efficiently. However, their larger problem is that they didn’t need to solve their own problems with the resources at their disposal, they only had to wait until someone with money comes to their farm and solves their problems with a quick stroke of a pen. 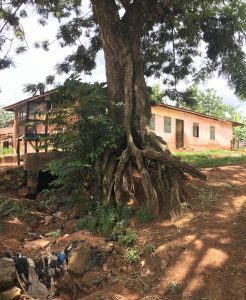 The analogy that I believe to be true in several cases around the world is this: just like the tree that the ground is washing out from under, so too is the ability of impoverished people to solve their own challenges. The tree does not know the soil is being washed away around it, the people here probably don’t give the erosion a second thought. However, when I first came to the community, erosion is the first thing I noticed. It often takes an outsider’s perspective to see things from a different angle. I see a tree that is dying slowly because it cannot gather its own water anymore and a soil that will not support the next generation of trees. I also see people that don’t have a need to create innovative solutions because of the outpouring of investment from the rest of the world. I know that this scenario does not represent the situations of all impoverished communities and that this attitude is not representative of all groups coming to aid people around the world. However, I think if it is true with the group of farmers that asked us for the tractor then it could be true in countless other areas around the world. In the future, we have to consider both the short and long term impacts of our investment in people around the world. Our help might actually hurt in the long term. Joel Reddick received a degree in Agronomy from Murray State University. Before serving as an AgriCorps Fellow Joel worked on his family’s farm in western Kentucky.